Course Description:Iconography holds a sacred piece of our life in the Church, and through learning to paint an icon, we can embrace a deeper understanding of the original visual language of our Christian faith. In this studio class, the fundamentals of Byzantine icon painting will be shared through learning the basic process, art and language of the icon as students are led step-by-step through making a simple and beautiful icon of Christ. 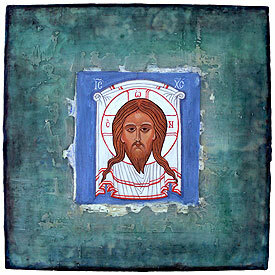 Along with icon history, color symbolism and basic theology of the icon, specific studio exercises on the specific painting techniques and approach for using traditional egg tempera and mineral pigments on a gessoed panel will be covered. There will be some additional reading on icon history outside of class, along with several short assignments (if taken for credit). Individualized suggestions of further ways to continue to explore and grow in understanding the beauty of icons and sacred art will be encouraged. High school students and adults from the community are welcome to register by contacting Dr. Brian FitzGerald, Academic Dean, at [email protected].